In 2017, both the Minneapolis Public School (MPS) and St. Paul Public School (SPPS) district teacher contracts have expired. The termination of this contract sent the teachers of both districts into negotiation with their district for the next contract’s terms. This year, negotiations between the Minneapolis Federation of Teachers (MFT), as well as the St. Paul Federation of Teachers (SPFT), and their districts have been a bit more complicated, with disagreements of the proposed changes on the district’s end: “The contractual changes that we’re asking for are not outrageous; they are best practices for teaching and learning for kids and staff,” said South English teacher Michelle Ockman. The strike was called off on February 12th at 2am, just a day before it was to take place, when the district and union came to a tentative agreement. For this contract, the MFT has a ten point plan of the requirements they feel would be in all schools best interests to get passed. “The ten point plan and what our union stewards are fighting for is important because we need to do what is best for students. What is best for students is what is on that plan,” said Ockman. 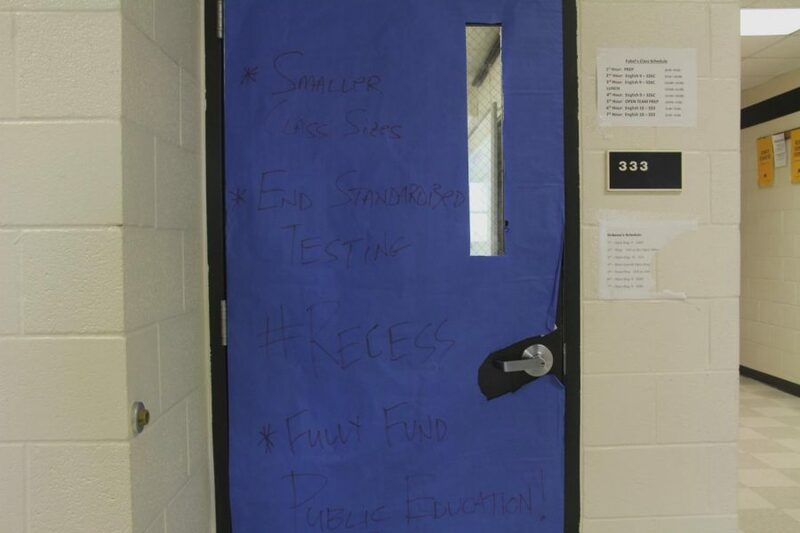 According to the MFT and Education Support Personnel website, the list of demands from MPS teachers consists of smaller class sizes, reducing standardized testing, restorative practices for discipline, cleaner learning environments, $15 for all MPS employees, mandatory recess, and a more equitable education. However, many points of the MFT plan are contradicted by the proposed plans of the district, some of which including cutting rather than increasing teacher pay, removing the number cap on class sizes, and bringing school down to a six period day. “They are considering cutting teacher pay, which is absolutely ridiculous. I think if they went that far they would have a lot of very angry people,” said Ockman. The effect of a pay decrease could potentially impact the teachers’ lives, especially those in their earlier years on the job. Many teachers believe that the district plans for schools do not have the wellbeing of the schools in mind. “The only thing the district is focused on right now is saving every penny it can. It’s focused on where it can cut and not what it can do better,” said social studies teacher Robert Panning-Miller. “We are professional as teachers and need to be trusted to do our jobs without being told the curriculum that we need to teacg. In order to respect that, you could get rid of a lot of those top heavy positions at the district and then save a lot of money that way,” Ockman explained. In St. Paul, the SPTF also had essential points they were working towards passing. Some of these points include better accommodation for English Language Learners, more adequate support for Special Ed students, smaller class sizes, and using restorative justice over traditional disciplinary punishment. As conversation continues and teachers begin to get frustrated towards the lack of district compliance with their plan, questions will most likely begin to arise as to what the next step will be. For the teachers of St. Paul, it took calling a strike to be heard, and some MPS teachers are beginning to think a strike could be right for them as well.